I had written a post about the part Carrots and Sticks plays in motivation, and this post has languished in my drafts folder for almost a year. It was complete, at least, I thought it was, but it has never seen light of day because I felt that something wasn’t quite right but I couldn’t put my finger on it. Then I picked up this book Drive: The surprising truth about what motivates us and it just made perfect sense. 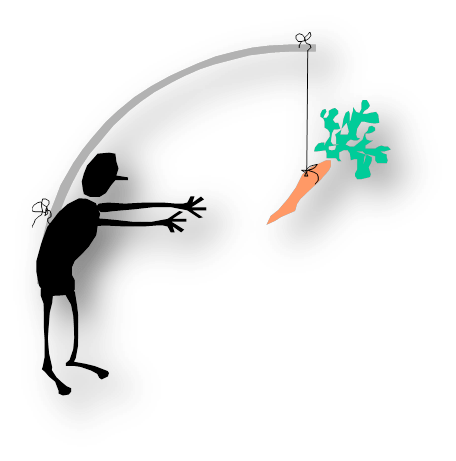 I had written about needing to have your carrots and sticks in the right balance for motivation to work but in my gut, I knew that it was too simplistic and my own experience managing people also disproved that theory. My anecdotal experience and observations about trying to motivate with financial rewards was that the rewards became an expectation for baseline performance instead of improving performance! The number of times I have heard people complain about their bonus payments… I’ve lost count. And it always baffled me that a bonus (see definition!) can result in complaints. The book talks about the evolution of motivation from survival instincts, to carrot and sticks, to its latest form, what the author calls Motivation 3.0 which replaces carrots and sticks with values and purpose. What was most interesting for me was the proof that carrot and sticks don’t work, especially in work that is complex, requires creativity or problem solving. The examples quoted showed reduce creativity, short term thinking at the expense of long term results. My take on this is that the brain is distracted by the reward instead of motivated by it. The conclusion is that autonomy, mastery and purpose are far more effective motivators than carrots and sticks. I highly recommend reading the book to find out why. Its applications extend beyond the business world to other areas of life like exercise and parenting (which is also of particular interest to me). Note to parents: do not give your children pocket money for chores!